Cats Whisker Fritz Gh L/S Trout Fishing Fly #10, from Troutcatchers tied with the very best fly tying materials avaialble on the troutcatcher fly tying pages. 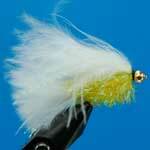 Tied by world class professionally trained fly tiers. NOT TRIED AS YET BUT HAVE EVERY CONFIDENCE IN THIS VERY WELL MADE FLY.